The Thing is a 1982 American science fiction horror film directed by John Carpenter and written by Bill Lancaster. Based on the 1938 John W. Campbell Jr. novella Who Goes There? , it tells the story of a group of American researchers in Antarctica who encounter the eponymous "Thing", a parasitic extraterrestrial life-form that assimilates, then imitates other organisms. The group is overcome by paranoia and conflict as they learn that they can no longer trust each other and that any one of them could be the Thing. The film stars Kurt Russell as the team's helicopter pilot, R.J. MacReady, and features A. Wilford Brimley, T. K. Carter, David Clennon, Keith David, Richard Dysart, Charles Hallahan, Peter Maloney, Richard Masur, Donald Moffat, Joel Polis, and Thomas Waites in supporting roles. Production began in the mid-1970s as a faithful adaptation of the novella, following 1951's popular The Thing from Another World . The Thing went through several directors and writers, each with different ideas on how to approach the story. Filming lasted roughly 12 weeks, beginning in August 1981, and took place on refrigerated sets in Los Angeles as well as in Juneau, Alaska, and Stewart, British Columbia. Of the film's $15 million budget, $1.5 million was spent on Rob Bottin's creature effects, a mixture of chemicals, food products, rubber, and mechanical parts turned by his large team into an alien capable of taking on any form. The Thing was released in 1982 to very negative reviews. It was described as "instant junk", "a wretched excess", and proposed as the most hated film of all time. Reviews both praised the special effects achievements and criticized their visual repulsiveness, while others focused on poor characterization. The film earned $19.6 million during its theatrical run. 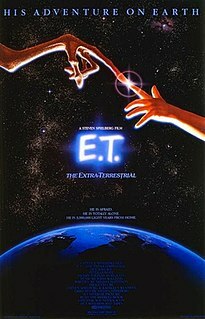 Many reasons have been cited for its failure to impress audiences: competition from films such as E.T. the Extra-Terrestrial , which offered an optimistic take on alien visitation; a summer that had been filled with successful science fiction and fantasy films; and an audience, living through a recession, diametrically opposed to The Thing's nihilistic tone. The film found an audience when released on home video and television. In the years since, it has been reappraised as one of the best science fiction or horror films ever made, and has gained a cult following. Filmmakers have noted its influence on their work, and it has been referred to in other media such as television and video games. 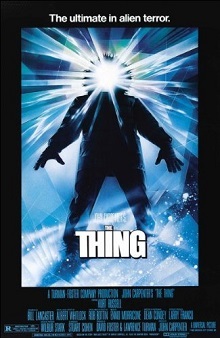 The Thing has spawned a variety of merchandise, including a 1982 novelization, haunted houses, board games, and sequels in comic books, a video game of the same name, and a 2011 prequel film of the same name. A novelization is a derivative novel that adapts the story of a work created for another medium, such as a film, TV series, comic book or video game. Film novelizations were particularly popular before the advent of home video, but continue to find commercial success as part of marketing campaigns for major films. They are often written by accomplished writers based on an early draft of the film's script and on a tight deadline. A haunted attraction is a form of live entertainment that simulates the experience of covering haunted locations or envisioning horror fiction. They usually feature fearsome sets and characters, especially ghosts, monsters, demons, witches, serial killers, and/or psychopaths. Humourous characters may also be included. Sled dogs were important for transportation in arctic areas, hauling supplies in areas that were inaccessible by other methods. They were used with varying success in the explorations of both poles, as well as during the Alaskan gold rush. Sled dog teams delivered mail to rural communities in Alaska and northern Canada. Sled dogs today are still used by some rural communities, especially in areas of Alaska and Canada and throughout Greenland. They are used for recreational purposes and racing events, such as the Iditarod Trail and the Yukon Quest. Clark kennels the sled dog, and it soon metamorphoses and absorbs the station dogs. This disturbance alerts the team and Childs uses a flamethrower to incinerate the creature. Blair autopsies the new creature and learns that it can perfectly imitate other organisms. Recovered Norwegian data leads the Americans to a large excavation site containing a partially buried alien spacecraft, and a smaller, human-sized dig site. Norris estimates that the alien ship has been buried for at least 100,000 years. Blair grows paranoid that the creature could assimilate all life on Earth in a matter of years. The station implements controls to reduce the risk of assimilation. The "dead", malformed humanoid creature assimilates an isolated Bennings, but Windows interrupts the process and MacReady burns the Bennings-Thing. Blair sabotages all the vehicles, kills the remaining sled dogs, and destroys the radio to prevent escape. The team imprison him in a tool shed. Copper suggests a test to compare each member's blood against uncontaminated blood held in storage, but after learning that the blood stores have been destroyed, the men lose faith in Garry, and MacReady takes command. MacReady, Windows and Nauls find Fuchs's burnt corpse and surmise he committed suicide to avoid assimilation. Windows returns to base while MacReady and Nauls investigate MacReady's shack. On their return, Nauls abandons MacReady in a snowstorm, believing he has been assimilated after finding his torn clothes in the shack. The team debate whether to allow MacReady inside, but he breaks in and holds the group at bay with dynamite. During the encounter, Norris appears to suffer a heart attack. As Copper attempts to defibrillate Norris, his chest transforms into a large mouth and bites off Copper's arms, killing him. MacReady incinerates the Norris-Thing, but its head separates from the body and attempts to escape before also being burnt. MacReady is forced to kill Clark in self-defense when the latter lunges at him from behind with a knife. He hypothesizes that the Norris-Thing's head demonstrated that every part of the Thing is an individual life form with its own survival instinct. He sequentially tests blood samples with a heated piece of wire. Everyone passes the test except Palmer, whose blood jumps from the heat. Palmer transforms and infects Windows, forcing MacReady to burn them both. Defibrillation is a treatment for life-threatening cardiac dysrhythmias, specifically ventricular fibrillation (VF) and non-perfusing ventricular tachycardia (VT). A defibrillator delivers a dose of electric current to the heart. Although not fully understood, this would depolarize a large amount of the heart muscle, ending the dysrhythmia. Subsequently, the body's natural pacemaker in the sinoatrial node of the heart is able to re-establish normal sinus rhythm. Childs is left on guard while the others go to test Blair. They find that Blair has escaped, and has been using vehicle components to assemble a small spacecraft. On their return, Childs is missing and the power generator is destroyed. MacReady speculates that the Thing intends to return to hibernation until a rescue team arrives. MacReady, Garry, and Nauls decide to detonate the entire station to destroy the Thing. As they set explosives, Blair kills Garry and Nauls disappears. Blair transforms into an enormous creature and destroys the detonator. MacReady triggers the explosives using a stick of dynamite, destroying the base. MacReady sits nearby as the station burns. Childs returns, saying he became lost in the storm while pursuing Blair. Exhausted and slowly freezing to death, they acknowledge the futility of their distrust and share a bottle of scotch. 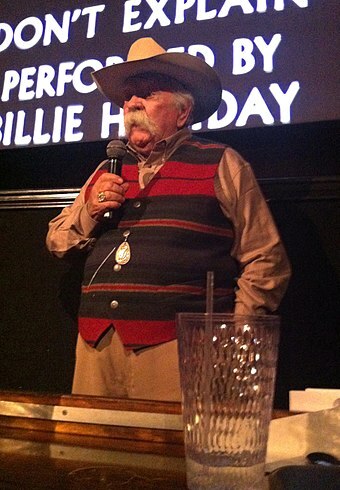 Actor Wilford Brimley in 2012. He was cast for his everyman persona that would allow audiences not to notice his absence from the story until the right time. 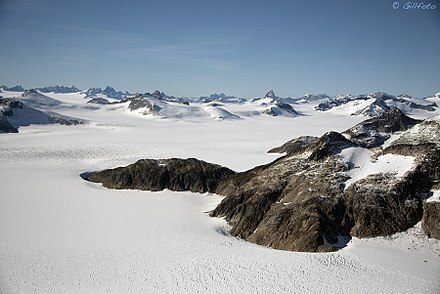 Principal photography began in August 1981 in Juneau, Alaska. Ennio Morricone created a sound that replicated John Carpenter's own style of synthesized music. The piece is used throughout The Thing. The Thing assimilating dogs. 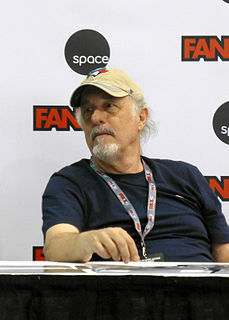 Stan Winston was brought in to help complete the effect. It was operated on a raised set with puppeteers working below. The Norris-Thing. False arms were attached to a double amputee, allowing them to be "bitten off" by the chest mouth. A special opening premiere of The Thing was held at the Hollywood Pacific Theatre, hosted by Elvira, Mistress of the Dark. "I take every failure hard. The one I took the hardest was The Thing. My career would have been different if that had been a big hit ... The movie was hated. Even by science-fiction fans. They thought that I had betrayed some kind of trust, and the piling on was insane. Even the original movie's director, Christian Nyby, was dissing me." 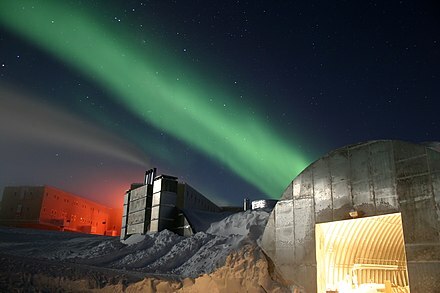 The Thing is screened annually at the Amundsen–Scott South Pole Station. Predator is a 1987 American science fiction action horror film directed by John McTiernan and written by brothers Jim and John Thomas. It stars Arnold Schwarzenegger as the leader of an elite military rescue team on a mission to save hostages in guerrilla-held territory in Central America. Kevin Peter Hall co-stars as the Predator who is a technologically advanced space alien monster spying, stalking, and hunting the main characters. Predator was written in 1984, under the working title of Hunter. Filming ran from March-June 1986 and creature effects were devised by Stan Winston. Stanley "Stan" Winston was an American television and film special make-up effects creator. He was best known for his work in the Terminator series, the first three Jurassic Park films, Aliens, the first two Predator films, Inspector Gadget, Iron Man and Edward Scissorhands. He won four Academy Awards for his work. Slither is a 2006 American science fiction horror film written and directed by James Gunn in his directorial debut. 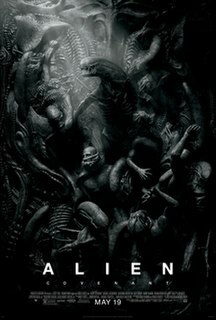 Starring Nathan Fillion, Elizabeth Banks, Tania Saulnier, Gregg Henry, and Michael Rooker, the film depicts a small town in South Carolina that becomes invaded by a malevolent alien parasite. Robin R. Bottin is an American special make-up effects creator. Known for his collaborations with directors John Carpenter, Paul Verhoeven and David Fincher, Bottin worked with Carpenter on both The Fog and The Thing, with Verhoeven on RoboCop, Total Recall and Basic Instinct, and with Fincher on Se7en and Fight Club. His other film credits include Legend, Innerspace and Fear and Loathing in Las Vegas. The Thing is a 2002 third-person shooter survival horror video game developed by Computer Artworks and co-published by Universal Interactive under their Black Label Games publishing label and Konami. 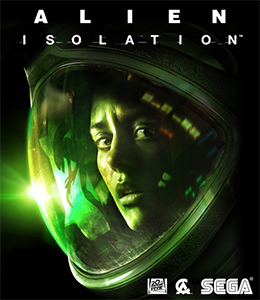 It was released for Windows, Xbox and PlayStation 2. Game Boy Color and Game Boy Advance versions were also planned, but both were cancelled early in development. Dean Raymond Cundey, A.S.C. is an American cinematographer and film director. He is known for his collaborations with John Carpenter, Steven Spielberg, Robert Zemeckis, as well as his extensive work in the horror genre, in addition to numerous family and comedy films. He was nominated for an Academy Award for Best Cinematography for his work on Who Framed Roger Rabbit and has been nominated for numerous BAFTAs and BSC Awards. Mos Eisley is a spaceport town in the fictional Star Wars universe. Located on the planet Tatooine, it first appeared in the 1977 film Star Wars, described by the character Obi-Wan Kenobi as a "wretched hive of scum and villainy." Jed was an animal actor, known for his roles in the movies: White Fang (1991), White Fang 2: Myth of the White Wolf (1994), The Journey of Natty Gann (1985), and The Thing (1982). He was born in 1977 and died in June 1995 at the age of 18. He was a wolf-malamute. A Quiet Place is a 2018 American post-apocalyptic horror film directed by John Krasinski, who wrote the screenplay with Bryan Woods and Scott Beck. The film stars Krasinski, alongside Emily Blunt, Millicent Simmonds, and Noah Jupe. The plot revolves around a family struggling to survive in a post-apocalyptic world inhabited by blind extraterrestrial creatures with an acute sense of hearing. 1 2 3 4 5 6 7 8 Lambie 2018a. 1 2 3 4 5 6 7 Lyttelton 2012. 1 2 Manna 1982, p. 22. 1 2 Swires 1982c, p. 26. 1 2 3 4 5 6 7 8 9 10 11 12 13 14 15 16 Bauer 1999. 1 2 3 4 5 6 7 8 9 Hemphill 2017. 1 2 3 4 5 Cohen 2013. 1 2 3 4 5 6 7 8 9 10 11 Freer 2016. 1 2 Bloody Disgusting 2014. 1 2 3 4 Abrams 2014. 1 2 Cinephilia Beyond 2017. 1 2 3 4 5 Swires 1982, p. 16. 1 2 3 Swires 1982, p. 17. 1 2 3 Billson 2009. 1 2 Swires 1982, p. 19. 1 2 3 4 5 6 7 8 Corrigan 2017. 1 2 3 Cohen 2011b. ↑ Swires 1982c, p. 27. 1 2 3 4 5 6 7 8 9 Kirk 2011. 1 2 3 4 5 6 7 8 9 10 11 12 13 14 Abrams 2016. 1 2 3 4 5 6 Beresford 2017. 1 2 3 4 5 6 7 Canby 1982. 1 2 3 GamesRadar+ 2008. 1 2 The Official John Carpenter 2008. 1 2 3 4 5 Swires 1982b, p. 38. ↑ Swires 1982b, p. 39. 1 2 Swires 1982c, p. 28. 1 2 3 4 5 6 7 Menzies 2017. 1 2 3 4 5 Mahon 2018. 1 2 3 4 Evangelista 2017. ↑ Fuiano & Curci 1994, p. 24. 1 2 Fuiano & Curci 1994, pp. 24–25. ↑ Fuiano & Curci 1994, p. 25. 1 2 3 4 5 Carlomagno 1982, p. 13. 1 2 3 4 Carlomagno 1982, p. 14. 1 2 3 Martin 2018. ↑ Carlomagno 1982, p. 16. 1 2 Nugent & Dyer 2017. 1 2 3 Cohen 2011. 1 2 Box Office 2018. 1 2 Box Office Mojo 1982. 1 2 3 Fried 2017. ↑ Billson 1997, pp. 8, 10. 1 2 3 4 5 6 7 8 Arnold 1982. 1 2 3 4 5 6 7 8 Spencer 1982, p. 69. 1 2 3 4 5 6 7 Denby 1982, pp. 53–54. 1 2 3 4 5 Ansen 1982. 1 2 3 4 5 6 Ebert 1982. 1 2 3 4 5 Schickel 1982. 1 2 3 4 Variety 1981. 1 2 Hardy 1984, p. 378. ↑ Leitch & Grierson 2017. ↑ Foster 1982b, p. 83. ↑ Foster 1982b, p. 87. ↑ LATMay83 1983, p. 38. 1 2 3 Berlatsky 2011. 1 2 3 Tallerico 2017. 1 2 Clarkson Fisher 2017. 1 2 Anderson, K 2017. 1 2 3 Grey 2011. 1 2 3 Muir 2013, p. 285. 1 2 3 Thurman 2017. ↑ Hoffman & Kelly 2017. ↑ Foster 1982a, pp. 99–114. ↑ Foster 1982a, pp. 189–90. 1 2 3 Turke 2011. ↑ Box Office Mojo 2011. Abrams, Simon (September 26, 2014). "John Carpenter Talks About His Storied Filmmaking Career, Creative Differences, and the Term 'Slasher'". Vulture.com . Archived from the original on January 5, 2015. Retrieved January 4, 2015. Abrams, Simon (October 13, 2016). "The Men Who Were The Thing Look Back on a Modern Horror Classic". LA Weekly . Archived from the original on February 3, 2018. Retrieved February 3, 2018. Adams, Sam (November 4, 2011). "John Carpenter". The A.V. Club . Archived from the original on May 22, 2018. Retrieved May 22, 2018. "Scorekeeper May Or May Not Be The Thing But Bsx Records Latest Release Definitely Is! I'M Giving Away Ten Copies Too!!". Ain't It Cool News. October 15, 2011. Archived from the original on February 12, 2018. Retrieved February 12, 2018. Anderson, K (January 19, 2015). "Directors Cuts: Top 5 John Carpenter Movies". Nerdist . Archived from the original on February 12, 2018. Retrieved February 11, 2018. Anderson, K (June 19, 2017). "John Carpenter's The Thing Is More Lovecraftian Than You Thought". Nerdist . Archived from the original on March 18, 2018. Retrieved March 18, 2018. Anderson, Martin (June 3, 2008). "The Den of Geek interview: John Carpenter". Den of Geek! . Archived from the original on February 15, 2013. Retrieved February 9, 2018. Ansen, David (June 28, 1982). "Frozen Slime". Newsweek . New York. OCLC 463876256 . Retrieved March 6, 2018. Arnold, Gary (June 25, 1982). "The Shape Of 'Thing' Redone". Washington Post. Archived from the original on April 23, 2018. Retrieved March 6, 2018. Bacle, Ariana (April 22, 2014). "'E.T. ': Best Summer Blockbusters, No. 6". Entertainment Weekly . Archived from the original on February 11, 2018. Retrieved February 10, 2018. Barone, Matt (August 12, 2013). "The 50 Best '80s Movies". Complex . Archived from the original on February 11, 2018. Retrieved February 11, 2018. Barone, Matt (August 22, 2014a). "Permanent Midnight: Body Horror Goes Much Deeper, and Gets Much Nastier, Than FX's "The Strain"". Complex . Archived from the original on April 14, 2018. Retrieved April 14, 2018. Bauer, Erik (January 1999). "John Carpenter on The Thing". creativescreenwriting. Archived from the original on January 27, 2018. Retrieved January 27, 2018. Beresford, Jack (May 10, 2017). "18 Things You Didn't Know About John Carpenter's The Thing". Screen Rant. Archived from the original on February 10, 2018. Retrieved February 10, 2018. Berlatsky, Noah (October 13, 2011). "What 'The Thing' Loses by Adding Women". The Atlantic . Archived from the original on March 18, 2018. Retrieved March 18, 2018. Billson, Anne (1997). The Thing. British Film Institute. ISBN 978-0851705668. Billson, Anne (August 27, 2009). "The Thing set on survival". The Guardian. Archived from the original on February 3, 2016. Retrieved January 24, 2018. "'The Thing' Originally Took Place Underwater; Plus, Carpenter Details the Day Horror Died…". Bloody Disgusting. October 1, 2014. Archived from the original on October 9, 2014. Retrieved January 25, 2018. "1982 Domestic Grosses". Box Office Mojo. 1982. Archived from the original on May 27, 2012. Retrieved January 30, 2018. "Blade Runner". Box Office Mojo. 2018. Archived from the original on July 21, 2012. Retrieved January 30, 2018. "The Thing (1982) – Weekend Box Office Results". Box Office Mojo. 1982. Archived from the original on December 19, 2008. Retrieved June 11, 2009. Boucher, Geoff (April 22, 2011). "J.J. Abrams: Seven films that shaped 'Super 8'". Pitchfork . Archived from the original on February 11, 2018. Retrieved February 11, 2018. "The Thing (1982)". Box Office Mojo. 2018. Archived from the original on January 29, 2018. Retrieved January 29, 2018. "June 25-27, 1982". Box Office Mojo. 1982. Archived from the original on January 29, 2018. Retrieved January 29, 2018. "Box Office Mojo". Box Office Mojo. November 1, 2011. Archived from the original on October 31, 2011. Retrieved November 1, 2011. Brigante, Ricky (July 19, 2011). "Halloween Horror Nights 2011 to feature 'The Thing' haunted house at Universal Studios in both Orlando and Hollywood". InsidetheMagic.com. Archived from the original on July 22, 2011. Retrieved July 19, 2011. Canby, Vincent (June 25, 1982). "'The Thing,' Horror And Science Fiction". The New York Times. Archived from the original on October 26, 2013. Retrieved March 6, 2018. Carlomagno, Ellen (August 1982). "Rob Bottin and The Thing". No. 021. Fangoria. "John Carpenter's 'The Thing': The Story of an SF Horror Game-Changer". cinephiliabeyond. November 2, 2017. Archived from the original on October 31, 2017. Retrieved January 24, 2018. Clarkson Fisher, Daniel (August 13, 2017). ""Just Wait": On the 35th Anniversary of John Carpenter's The Thing (1982)". Diabolique magazine. Archived from the original on March 18, 2018. Retrieved March 18, 2018. Cohen, Stuart (December 6, 2011). "A producers guide to the Evolution and production of John Carpenter's The Thing – The Palmer Transformation and the 25 million Dollar Film". The Original Fan. Archived from the original on February 14, 2018. Retrieved February 14, 2018. Cohen, Stuart (October 28, 2011b). "A producers guide to the Evolution and production of John Carpenter's The Thing – Casting MaccReady". The Original Fan. Archived from the original on February 13, 2018. Retrieved February 13, 2018. Cohen, Stuart (November 2, 2011c). "A producers guide to the Evolution and production of John Carpenter's The Thing – Casting Childs". The Original Fan. Archived from the original on February 13, 2018. Retrieved February 13, 2018. Cohen, Stuart (December 6, 2011d). "A producers guide to the Evolution and production of John Carpenter's The Thing – The Norwegian Photo". The Original Fan. Archived from the original on February 13, 2018. Retrieved February 13, 2018. Cohen, Stuart (October 6, 2011e). "A producers guide to the Evolution and production of John Carpenter's The Thing – The Three Bennings Deaths". The Original Fan. Archived from the original on June 24, 2013. Retrieved February 14, 2018. Cohen, Stuart (October 2, 2011f). "A producers guide to the Evolution and production of John Carpenter's The Thing – The Ending You Almost Saw". The Original Fan. Archived from the original on February 14, 2018. Retrieved February 14, 2018. Cohen, Stuart (September 28, 2011g). "A producers guide to the Evolution and production of John Carpenter's The Thing – The Final Days". The Original Fan. Archived from the original on February 14, 2018. Retrieved February 14, 2018. Cohen, Stuart (December 6, 2011h). "A producers guide to the Evolution and production of John Carpenter's The Thing – "The Thing" product reel". The Original Fan. Archived from the original on February 14, 2018. Retrieved February 14, 2018. Cohen, Stuart (April 7, 2012). "A producers guide to the Evolution and production of John Carpenter's The Thing – Casting Blair". The Original Fan. Archived from the original on February 13, 2018. Retrieved February 13, 2018. Cohen, Stuart (April 7, 2012b). "A producers guide to the Evolution and production of John Carpenter's The Thing – Nauls In Black And White". The Original Fan. Archived from the original on February 13, 2018. Retrieved February 13, 2018. Cohen, Stuart (September 13, 2012c). "A producers guide to the Evolution and production of John Carpenter's The Thing – Could This Man Play Palmer?". The Original Fan. Archived from the original on February 13, 2018. Retrieved February 13, 2018. Cohen, Stuart (April 7, 2012d). "A producers guide to the Evolution and production of John Carpenter's The Thing – Casting Garry And Copper". The Original Fan. Archived from the original on February 13, 2018. Retrieved February 13, 2018. Cohen, Stuart (April 7, 2012e). "A producers guide to the Evolution and production of John Carpenter's The Thing – Que Viva Windows". The Original Fan. Archived from the original on February 13, 2018. Retrieved February 13, 2018. Cohen, Stuart (April 5, 2012f). "A producers guide to the Evolution and production of John Carpenter's The Thing – The Novelisation". The Original Fan. Archived from the original on February 20, 2018. Retrieved February 20, 2018. Cohen, Stuart (June 25, 2013). "A producers guide to the Evolution and production of John Carpenter's The Thing – The Budget". The Original Fan. Archived from the original on February 13, 2018. Retrieved February 13, 2018. Corrigan, Kalyn (October 31, 2017). "Every John Carpenter Movie, Ranked from Worst to Best". Collider. Archived from the original on February 7, 2018. Retrieved February 7, 2018. Crowe, Jerry (June 24, 1995). "Arts and entertainment reports from The Times, national and international news services and the nation's press". Los Angeles Times. OCLC 78230037. Archived from the original on June 26, 2015. Retrieved June 25, 2015. "The Thing From Another World #1 (Of 2)". Dark Horse Comics. 2018a. Archived from the original on February 4, 2018. Retrieved February 4, 2018. "The Thing From Another World: Climate Of Fear #1 (Of 4)". Dark Horse Comics. 2018. Archived from the original on February 4, 2018. Retrieved February 4, 2018. "The Thing From Another World: Eternal Vows #1 (Of 4)". Dark Horse Comics. 2018. Archived from the original on February 4, 2018. Retrieved February 4, 2018. "Yamato, Jen. "John Carpenter Q&A: Why 'Halloween' Didn't Need Sequels & What Scares The Master Of Horror."". Deadline Hollywood . October 31, 2014. Archived from the original on February 21, 2016. Retrieved January 26, 2016. Denby, David (June 28, 1982). "Battle of the Stereotypes". New York . 15 (26). OCLC 29827364. Archived from the original on May 19, 2015. Retrieved March 6, 2018. Dowd, A.A. (November 2, 2017). "Check out John Carpenter's meticulous production designs for The Thing". The A.V. Club . Archived from the original on January 25, 2018. Retrieved January 24, 2018. Ebert, Roger (January 1, 1982). "The Thing". RogerEbert.com . Archived from the original on February 10, 2016. Retrieved March 6, 2018. Eddy, Cheryl (April 7, 2017). "Even Shape-Shifting Aliens Will Love This Gorgeous Art Inspired by John Carpenter's The Thing". io9. Archived from the original on February 5, 2018. Retrieved February 5, 2018. "Empire's The 500 Greatest Movies of All Time". Empire . 2008. Archived from the original on November 5, 2013. Retrieved May 21, 2010. Evangelista, Chris (October 19, 2017). "John Carpenter's 'Anthology: Movie Themes 1974-1998' Resurrects the Horror Master's Classic Music". /Film . Archived from the original on February 2, 2018. Retrieved February 2, 2018. Faulkner, Jason (October 31, 2017). "25 Body Horror Movies That Make Our Bones Hurt". Syfy. Archived from the original on April 14, 2018. Retrieved April 14, 2018. "The 10 Best Movies of 1982". Film.com . 2018. Archived from the original on June 18, 2010. Retrieved May 21, 2010. "Greatest Films of the 1980s – 1982". Filmsite.org . 2018. Archived from the original on July 24, 2010. Retrieved April 8, 2018. Fischer, Russ (January 4, 2018). "The 50 Greatest Sci-Fi Films Of All Time". Thrillist. Archived from the original on February 11, 2018. Retrieved February 11, 2018. Foster, Alan Dean (1982a). The Thing: A Novel. Bantam Books. ISBN 978-0-553-20477-3. Foster, David (1982b). "The Truth About Stark". Calendar. Los Angeles Times . Los Angeles. OCLC 78230037. Freer, Ian (January 7, 2016). "Paranoia, claustrophobia, lots of men: how The Thing inspired Tarantino's Hateful Eight". The Telegraph. Archived from the original on August 9, 2017. Retrieved January 28, 2018. French, Philip (August 27, 2009). "Halloween – review". The Guardian. Archived from the original on January 27, 2018. Retrieved January 27, 2018. Fried, Christopher (July 21, 2017). "'The Thing' Didn't Take Off In 1982, But 35 Years Later It's Seeing A Revival". The Federalist . Archived from the original on January 30, 2018. Retrieved January 30, 2018. Fuiano, Claudio; Curci, Loris (August 1994). "To Sooth the Savage Beast". No. 135. Fangoria. OCLC 46637019. "John Carpenter interview". GamesRadar+ . October 10, 2008. Archived from the original on February 3, 2018. Retrieved February 3, 2018. "The Thing From Another World Omnibus". Goodreads. Archived from the original on April 27, 2017. Retrieved February 18, 2018. Greene, Andy (October 8, 2014). 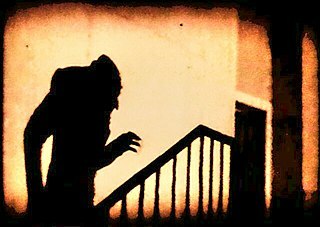 "Readers' Poll: The 10 Best Horror Movies of All Time". Rolling Stone . Archived from the original on February 8, 2018. Retrieved February 7, 2018. Grey, Orrin (October 24, 2011). "Cosmic Horror In John Carpenter's "Apocalypse Trilogy"". Strange Horizons . Archived from the original on January 27, 2018. Retrieved January 27, 2018. Gross, Linda (June 25, 1982). "The Thing". Los Angeles Times . Los Angeles. OCLC 78230037 . Retrieved March 6, 2018. Hammond, James (August 22, 2014). "10 essential records that show how Ennio Morricone revolutionised the film soundtrack". The Vinyl Factory . Archived from the original on February 11, 2018. Retrieved February 11, 2018. Hardy, Phil, ed. (1984). Science Fiction. New York : Morrow. ISBN 978-0-688-00842-0. Harrison, Mark (January 29, 2016a). "The Themes of John Carpenter's Apocalypse Trilogy". Den of Geek! . Archived from the original on March 18, 2018. Retrieved March 18, 2018. Harrison, Mark (January 29, 2016b). "John Carpenter's Apocalypse trilogy: a look back". Den of Geek! . Archived from the original on March 18, 2018. Retrieved March 18, 2018. Hemphill, Jim (2015). "The Thing". American Cinematographer . Archived from the original on February 13, 2018. Retrieved February 13, 2018. Hemphill, Jim (October 29, 2017). "Flashback: The Thing". American Cinematographer . Archived from the original on January 28, 2018. Retrieved January 28, 2018. Henderson, Eric (October 30, 2004). "The Thing". Slant Magazine . Archived from the original on February 8, 2018. Retrieved February 8, 2018. Hoffman, Jordan (October 12, 2015). "The 100 Best Sci-Fi Movies of All Time". Esquire . Archived from the original on February 4, 2018. Retrieved February 4, 2018. Hoffman, Jordan; Kelly, Tiffany (May 1, 2017). "The 100 Best Sci-Fi Movies of All Time". Popular Mechanics . Archived from the original on February 4, 2018. Retrieved February 4, 2018. Horton, H. Perry (November 18, 2016). "The Thing About The Hateful Eight: John Carpenter's Influence on Tarantino's Latest". Film School Rejects. Archived from the original on February 4, 2018. Retrieved February 4, 2018. Huddleston, Tom (September 19, 2016). "The 100 best horror films". Time Out . Archived from the original on February 11, 2018. Retrieved February 11, 2018. Hunter, Rob (October 10, 2016). "John Carpenter's The Thing Finally Gets the Blu-ray Treatment It Deserves". Film School Rejects. Archived from the original on February 8, 2018. Retrieved February 8, 2018. Jagernauth, Kevin (December 11, 2015). "Quentin Tarantino Reveals 'Hateful Eight' Score Features Unused Music By Ennio Morricone From John Carpenter's 'The Thing'". IndieWire. Archived from the original on December 13, 2015. Retrieved December 14, 2015. John Agnello, Anthony (October 27, 2016). "The Thing's video game sequel got everything right except the Thing". The A.V. Club . Archived from the original on February 4, 2018. Retrieved February 4, 2018. Kehr, Dave (1982). "The Thing". Chicago Reader . Archived from the original on March 6, 2018. Retrieved March 6, 2018. Kirk, Jeremy (July 13, 2011). "The 36 Things We Learned From John Carpenter's 'The Thing' Commentary Track". Film School Rejects. Archived from the original on January 30, 2018. Retrieved January 30, 2018. Lambie, Ryan (November 28, 2011). "In defence of The Thing prequel". Den of Geek! . Archived from the original on February 3, 2018. Retrieved February 3, 2018. Lambie, Ryan (June 26, 2012). "John Carpenter's The Thing at 30". Den of Geek! . Archived from the original on March 18, 2018. Retrieved March 18, 2018. Lambie, Ryan (January 22, 2014). "10 mystifying Razzie nominations". Den of Geek! . Archived from the original on February 6, 2018. Retrieved February 6, 2018. Lambie, Ryan (February 17, 2016). "John Carpenter: analysing his style and growing influence". Den of Geek! . Archived from the original on June 19, 2016. Retrieved February 11, 2018. Lambie, Ryan (November 9, 2017a). "The Thing's missing blow-up doll and other deleted scenes". Den of Geek! . Archived from the original on January 31, 2018. Retrieved January 31, 2018. Lambie, Ryan (June 26, 2017b). "Examining the critical reaction to The Thing". Den of Geek! . Archived from the original on February 11, 2018. Retrieved February 10, 2018. Lambie, Ryan (January 4, 2018a). "John Carpenter's The Thing Had An Icy Critical Reception". Den of Geek! . Archived from the original on January 31, 2018. Retrieved January 31, 2018. Lambie, Ryan (February 16, 2018b). "Films That Led To Other Films Being Cancelled". Den of Geek! . Archived from the original on February 25, 2018. Retrieved February 25, 2018. "The Stakes Rise in Producer's Lawsuit". Calendar. Los Angeles Times . Los Angeles. May 8, 1983. OCLC 78230037. "The 25 best sci-fi movies that are out of this world". GamesRadar+ . February 9, 2018. Archived from the original on February 11, 2018. Retrieved February 11, 2018. "Top 100 Sci Fi Films – #4 The Thing". IGN. 2016. Archived from the original on February 4, 2018. Retrieved February 4, 2018. "Best Sci-Fi Movies Of All Time". Rotten Tomatoes. 2017. Archived from the original on February 4, 2018. Retrieved February 4, 2018. Leitch, Will; Grierson, Tim (September 6, 2017). "Every Stephen King Movie, Ranked From Worst to Best". Vulture.com . Archived from the original on February 3, 2018. Retrieved February 3, 2018. Liebman, Martin (September 23, 2008). "The Thing Blu-ray". IGN . Archived from the original on February 8, 2018. Retrieved February 8, 2018. Lingan, John (August 4, 2010). "Take Two #1: The Thing from Another World (1951) and The Thing (1982)". Slant Magazine . Archived from the original on March 18, 2018. Retrieved March 18, 2018. Liptak, Andrew (July 12, 2017). "Neill Blomkamp on creating the horrific creature in his latest short film Zygote". The Verge . Archived from the original on February 11, 2018. Retrieved February 11, 2018. Lozano, Kevin (February 14, 2017). "Ennio Morricone's Score for John Carpenter's The Thing Gets Reissue". Los Angeles Times. Archived from the original on February 2, 2018. Retrieved February 2, 2018. Lyttelton, Oliver (June 25, 2012). "5 Things You Might Not Know About John Carpenter's 'The Thing'". IndieWire. Archived from the original on January 31, 2018. Retrieved January 31, 2018. Maçek III, J.C. (November 21, 2012). "Building the Perfect Star Beast: The Antecedents of 'Alien'". PopMatters . Archived from the original on November 27, 2012. Mahon, Christopher (January 16, 2018). "How John Carpenter'S The Thing Went From D-List Trash To Horror Classic". Syfy. Archived from the original on January 23, 2018. Retrieved January 24, 2018. Manna, Sal (August 22, 1982). "Stark: Credit's 'The Thing'". Calendar. Los Angeles Times . Los Angeles. OCLC 78230037. Marlborough, Patrick (August 29, 2016). "After 35 Years 'The Thing' Is Still Our Most Suffocating Horror Film". Vice . Archived from the original on March 18, 2018. Retrieved March 18, 2018. Martin, Michael (February 28, 2018). "Stan Winston's Dog-Thing From 'The Thing' – Creating An Iconic Alien". Stan Winston School. Archived from the original on March 3, 2018. Retrieved March 3, 2018. McLane, Marie (March 8, 2013). "South Pole Enters Winter With Crew Of 44 People". The Antarctic Sun. Archived from the original on February 26, 2015. Retrieved August 31, 2014. "The Thing – Releases". AllMovie. Archived from the original on January 16, 2013. Retrieved February 28, 2018. "The Thing". Amazon. 2018. Archived from the original on February 8, 2018. Retrieved February 4, 2018. The Thing. 2018. ISBN 978-0783227504. "The Thing Blu-Ray Review". IGN. September 29, 2008. Archived from the original on February 8, 2018. Retrieved February 8, 2018. Menzies, James L. (June 25, 2017). "13 Fascinating Facts About The Thing". Mental Floss . Archived from the original on January 23, 2018. Retrieved January 23, 2018. "The Thing: Blair Monster". Spawn.com. 2018. Archived from the original on September 29, 2011. Retrieved February 11, 2018. "The Thing: Norris Creature & Spider". Spawn.com. 2018. Archived from the original on September 29, 2011. Retrieved February 11, 2018. "Quint Looks At Some Damn Cool Upcoming Movie Toys: Sin City, Darko, Klowns, Thing, Am. Werewolf And More!!". Ain't It Cool News. February 27, 2005. Archived from the original on February 11, 2018. Retrieved February 11, 2018. Meslow, Scott (March 23, 2018). "Steven DeKnight Went From Pacific Rim Fanboy to Pacific Rim Uprising Director". GQ . Archived from the original on March 23, 2018. Retrieved March 23, 2018. "The Thing Reviews". Metacritic. 2011. Archived from the original on October 8, 2011. Retrieved October 14, 2011. "The Thing for PlayStation 2 Reviews, Ratings, Credits, and More at Metacritic". Metacritic. 2002. Archived from the original on March 20, 2014. Retrieved January 31, 2012. "The Thing for PC Reviews, Ratings, Credits, and More at Metacritic". Metacritic. 2002. Archived from the original on March 20, 2014. Retrieved January 31, 2012. Muir, John Kenneth (2013). Horror Films of the 1980s. McFarland & Company. ISBN 9780786455010. Murphy, Sean (March 18, 2018). 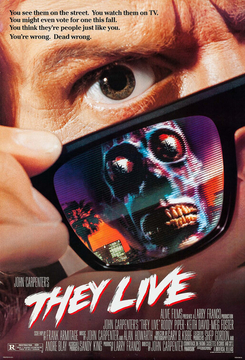 "'They Live' Is the Most Blunt Critique of Unfettered Capitalism Ever Committed to Celluloid". PopMatters . Archived from the original on March 18, 2018. Retrieved March 18, 2018. "The Thing [Original Score]". AllMusic. 2018. Archived from the original on February 11, 2018. Retrieved February 11, 2018. Nicholls, Peter (28 June 2016). "Thing, The". The Encyclopedia of Science Fiction. Archived from the original on 28 June 2016. Retrieved 8 July 2016. Nordine, Michael (May 23, 2016). "Guillermo del Toro Praises John Carpenter in Epic Twitter Marathon". IndieWire. Archived from the original on March 15, 2017. Retrieved January 31, 2018. Nugent, John; Dyer, James (October 19, 2017). "The 50 Best Movie Posters Ever". Empire . Archived from the original on February 5, 2018. Retrieved February 5, 2018. O'Callaghan, Paul (November 4, 2016). "10 great films about aliens visiting Earth". British Film Institute. Archived from the original on June 5, 2015. Retrieved February 5, 2018. O'Neill, Phelim (October 31, 2013). "John Carpenter: 'Halloween's a very simple film'". The Telegraph . Archived from the original on February 13, 2018. Retrieved February 13, 2018. "The 100 Best Sci-Fi Movies of All Time". Paste . November 13, 2018. Archived from the original on November 19, 2018. Retrieved November 19, 2018. Paul, Zachary (October 7, 2011). "EXCLUSIVES[Interview] 'The Thing 2011' Screenwriter Explains How The Film Transformed Into What You Saw!!!". Bloody Disgusting. Archived from the original on February 28, 2018. Retrieved February 28, 2018. Paul, Zachary (June 25, 2017). "From "Instant Junk" to "Instant Classic" – Critical Reception of 'The Thing'". Bloody Disgusting. Archived from the original on February 7, 2018. Retrieved February 7, 2018. Peitzman, Louis (November 26, 2014). "44 Body Horror Movies To Kill Your Appetite". BuzzFeed. Archived from the original on September 6, 2015. Retrieved April 14, 2018. Penzey, Caitlin (December 14, 2017). "The Thing board game is as infectious as the movie". The A.V. Club . Archived from the original on January 1, 2018. Retrieved February 5, 2018. Phalin, Mike (September 28, 2008). "Event Report: Universal Orlando's Halloween Horror Nights 18". Dread Central. Archived from the original on February 21, 2018. Retrieved February 21, 2018. "The Thing 1982". Metacritic. 2018. Archived from the original on February 3, 2018. Retrieved February 3, 2018. Rife, Katie (July 19, 2017). "Take an exclusive look at Mondo's limited-edition The Thing board game". The A.V. Club . Archived from the original on December 30, 2017. Retrieved February 5, 2018. Rome, Emily (May 3, 2013). "Five things we learned about John Carpenter's horror classic 'The Thing' at EW's CapeTown Film Fest". Entertainment Weekly . Archived from the original on January 3, 2015. Retrieved January 3, 2015. Rosenbaum, Jonathan (July 10, 1982). "On Location with John Carpenter's The Thing". JonathanRosenbaum.net . Archived from the original on October 8, 2013. Retrieved January 29, 2018. Rothkopf, Joshua (2018). "Street fighting men". Time Out . Archived from the original on October 8, 2012. Retrieved September 6, 2014. "The Thing Movie Reviews, Pictures". Rotten Tomatoes. 2018. Archived from the original on February 11, 2010. Retrieved May 21, 2010. Saturn Awards (1982). "Past Saturn Award Recipients". saturnawards.org. Academy of Science Fiction, Fantasy and Horror Films. Archived from the original on February 24, 2018. Retrieved February 24, 2018. Sauriol, Patrick (February 16, 2009). "Exclusive: A Look at the Return of the Thing screenplay". Corona's Coming Attractions. Archived from the original on July 10, 2012. Retrieved April 8, 2018. Schedeen, Jesse (June 25, 2017). "15 Things You Never Knew About John Carpenter's 'The Thing'". Moviefone. Archived from the original on February 9, 2018. Retrieved February 8, 2018. Scheider, Steven Jay (2013). 1001 Movies You Must See Before You Die. Murdoch Books Pty Limited. p. 681. ISBN 978-0-7641-6613-6. Schickel, Richard (June 28, 1982). "Cinema: Squeamer". Time. Archived from the original on February 10, 2010. Retrieved March 6, 2018. Smith, Adam (January 1, 2000). "The Thing Review". Empire . Archived from the original on April 14, 2018. Retrieved April 14, 2018. Spencer, Alan (November 1982). "John Carpenter's The Thing". No. 64. Starlog. OCLC 932845198. Spry, Jeff (July 17, 2017a). "New Details Thaw On Arrow'S Crystalline 4K Release Of The Thing". Syfy. Archived from the original on February 9, 2018. Retrieved February 9, 2018. Spry, Jeff (June 25, 2017b). "The Thing At 35: Lasting Impressions Of The Ultimate In Alien Terror". Syfy. Archived from the original on January 30, 2018. Retrieved January 30, 2018. Spry, Jeff (June 30, 2017c). "The Thing Fans Planning Epic 40th Anniversary Trek To Filming Sites". Syfy. Archived from the original on March 4, 2018. Retrieved March 4, 2018. Stein, Elliott (June 20, 1982). "Have Horror Films Gone Too Far?". The New York Times. Archived from the original on February 13, 2018. Retrieved February 13, 2018. Svitil, Torene (June 6, 1990). "Rob Bottin: A Wizard in the World of Special Effects : Movies: The makeup effects artist creates more high-tech illusion in the futuristic action-thriller 'Total Recall.'". Los Angeles Times. OCLC 78230037. Archived from the original on January 24, 2018. Retrieved January 24, 2018. Swires, Steve (May 1982). "Bill Lancaster on Scripting "The Thing" – or – "The Bad News Beast"". No. 58. Starlog. OCLC 932845198. Swires, Steve (June 1982b). "An Interview with Cinematographer Dean Cundey". No. 59. Starlog. OCLC 932845198. Swires, Steve (July 1982c). "John Carpenter Directing "The Thing"". No. 60. Starlog. OCLC 932845198. Tallerico, Brian (October 31, 2017). ""The Thing" That Wouldn't Die: On The Legacy Of John Carpenter's Classic Film". RogerEbert.com . Archived from the original on March 18, 2018. Retrieved March 18, 2018. Taylor, Drew (March 12, 2015). "Director David Robert Mitchell Reveals The 5 Biggest Influences On 'It Follows'". IndieWire. Archived from the original on February 13, 2018. Retrieved February 13, 2018. Taylor, Michael Edward (August 29, 2016). "15 Reasons Why John Carpenter's The Thing Is The Best Remake Of All Time". Screen Rant. Archived from the original on March 18, 2018. Retrieved March 18, 2018. "Production Notes". The Official John Carpenter. 2008. Archived from the original on May 15, 2008. Retrieved February 28, 2018. Thurman, Trace (June 25, 2017). "John Carpenter's 'The Thing' Turns 35 Today!". Bloody Disgusting. Archived from the original on February 4, 2018. Retrieved February 4, 2018. Thurman, Trace (February 20, 2018). "The 100 Best Horror Movies Ever Made (Ranked)". Bloody Disgusting. Archived from the original on February 7, 2018. Retrieved February 21, 2018. Tompkins, Dave (March 4, 2015). "Dismembrance of the Thing's Past". The Paris Review . Archived from the original on March 4, 2015. Retrieved February 3, 2018. Topolsky, Joshua (September 2, 2012). "The Classics: John Carpenter's 'Apocalypse Trilogy'". The Verge . Archived from the original on December 16, 2016. Retrieved February 4, 2018. Turke, Ryan (September 30, 2011). "Revisiting the Sequel to John Carpenter's The Thing". ComingSoon.net . Archived from the original on February 4, 2018. Retrieved February 4, 2018. Twells, John (October 31, 2013). "A beginner's guide to John Carpenter, Master of Horror". Fact . Archived from the original on February 12, 2018. Retrieved February 12, 2018. "'E.T' and 'Star Trek' top science fiction film nominees". United Press International. 1983. Archived from the original on February 24, 2018. Retrieved February 24, 2018. Variety (December 31, 1981). "The Thing". Variety . Archived from the original on March 6, 2018. Retrieved March 6, 2018. Vlastelica, Ryan (October 25, 2017). "The Thing shows how non-metaphoric monster movies come down to craft". The A.V. Club . Archived from the original on March 18, 2018. Retrieved March 18, 2018. Watts, Peter (January 2010). "The Things Fiction by Peter Watts". Clarkesworld Magazine . Archived from the original on September 7, 2016. Retrieved April 8, 2018. Whittaker, Richard (May 10, 2014). "John Carpenter Lit Up By El Rey". The Austin Chronicle . Archived from the original on February 9, 2018. Retrieved February 5, 2018. Williams, Owen (September 16, 2016). "The 50 best horror movies ever". Empire . Archived from the original on February 11, 2018. Retrieved February 11, 2018. Woods, Kevin (May 3, 2014). "Cool Horror Gear: SOTA's Now Playing The Thing Spiderhead Mini-Bust". JoBlo.com. Archived from the original on February 11, 2018. Retrieved February 11, 2018. Zinoman, Jason (August 19, 2011). "What Spooks the Masters of Horror?". The New York Times. Archived from the original on August 21, 2011. Retrieved August 23, 2011. Zoller Seitz, Matt (October 9, 2016). "30 Minutes On: "The Thing" (1982)". RogerEbert.com . Archived from the original on August 10, 2017. Retrieved February 11, 2018.